All Things Considered, the most listened-to afternoon drive-time news radio program on NPR, first began broadcasting in May 1971. The program consists of interviews, commentaries, and insights about the many facets of life in our country. The program’s title brings to mind the idea that in the field of education we must not only consider how we are going to educate our young charges, but also reconsider on a routine basis how we go about our work. 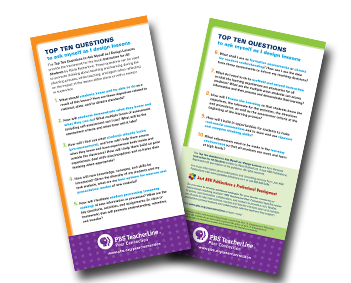 This newsletter examines a variety of questions that educators can contemplate at the beginning of the school year with the hope that a reexamination can provide direction that will make the year a more satisfying and successful endeavor, both personally and professionally. What is your personal decision-making process? Schools are hectic places to work, with complications and predicaments arising in a fast-paced manner. In our effort to resolve concerns quickly, we tend to rush to judgment in order to move on with our day, or to take on the next dilemma. This unwise practice of problem solving has been described as a Ready, Fire, Aim approach that not only can lead to a less than satisfactory conclusion but also exacerbate the situation. In order to deal more productively with daily quandaries, we can resolve to slow down, breathe, and be determined to make decisions in a more analytical and productive manner. Instead of rushing into a decision, a better approach is to think through options in a calm manner, debate the pros and cons, and resist the temptation to make decisions too quickly. It will pay off in the end. Are you gathering too many monkeys? Some educators, whether consciously or unconsciously, are inclined to take on problems of others thus increasing the number of “monkeys” they have on their backs or stacked around their office or classroom. The result of taking on too many of other people’s issues is that it increases one’s stress level and has the potential to reduce the ability to function at one’s optimum best. Each of us has a finite amount of time to do our jobs. Therefore, we must consider how we respond to other’s problems. We should carefully determine how to respond when someone brings a problem to our doorstep. Instead of being left holding the “monkey,” we can offer ideas or steps the individual might take and turn the problem back to the individual. Doing so does not make you less skilled or adept at doing your job; in fact it has the potential of empowering others by helping them resolve their own issues. Are you using your leadership skills in a productive manner? Every educator is a leader, whether as a teacher leading a classroom of youngsters, or as an administrator guiding the direction a school will take. How we use our leadership abilities will have a huge impact on those we lead. A “bully pulpit” approach is less likely to be as successful as a “gentle nudge” technique. It is important to remember that leadership is action and not position. Each of us should make it a priority to examine our leadership approach. Keep in mind that part of being a true professional is how we treat the personnel with whom we come into contact, and how we positively influence the work ethic and morale of others. We want to avoid, at all costs, any deleterious effects our interactions may have. As a professional, we may be required to put the interests of others ahead of our own interests. By establishing a clear vision of the outcomes we are pursuing and then leading others to attain that vision is the ultimate satisfying accomplishment. Does your school’s instructional program show evidence of rigor or rigor mortis? The beginning of a new school year is the ideal time to examine and discuss the school’s instructional program to determine what kind of learning environments have been established. Too often, we celebrate the end of the previous school year by breathing a sigh of relief that we made it through another year. Just “making it through” is an unacceptable way to think about such an important responsibility. We often begin the school year by talking about new initiatives and neglect to reflect on past practices. Are we keeping up with the current research and adding new practices to our instructional delivery? Are students excited about being at our school or are they just tolerating their current situation? Are we challenging our students to be thinkers or are we just presenting content? Are we working together to maximize success of all our colleages? Are we moving in the right direction to make the Common Core commonplace? Are you seeing each student for the person they yearn to be? In the busy-ness of our day, we sometimes focus on the content for which we are responsible while forsaking our responsibility to get to know our students on a more personal level. We can move through our day almost mechanically, never stopping to have a meaningful conversation with a student who may desperately want to talk with us but not know how to proceed. We may also make cursory judgments about our students based on outward demeanor or their apparent lack of interest in learning. Do you like that I’m here? Do you affirm my existence? Does your school have too many barriers that hinder student progress and success? In some schools or districts, there are practices, or even mandates, in place that may or may not be in the best interest of learning and student growth. For example, in some locales, there are zero-tolerance discipline policies that place some students in a revolving door situation when they are in and out of school repeatedly for committing an infraction. Moreover, there are schools that establish barriers that prohibit some students from taking more challenging courses. With this data in mind, a re-examination of current practices in some schools might be a move in the right direction. Are you finding humor or drudgery in your day-to-day life? There are some individuals who seem to be unhappy in their jobs, who take everything that happens in school so seriously, and who fail to find humor in any of life’s daily events. Perhaps our jobs would be more satisfying with a change of heart and a change of mind. Throughout my career, I have always appreciated the staff member who bounces into the teachers’ lounge with a big smile prepared with a ready-made witticism. Some of my favorite memories as a teacher and administrator stem from laughter. In his book Humor in Education: A Foundation for Wholesome Living, William Welker makes a strong case for a teacher’s obligation to teach pupils how to laugh as well as how to learn. He states that laughter is one of the most successful defenses man has found to combat the problems of daily life. I remember a recent quip from a teacher who referred to the population of the school as “the young and the rest of us.” Another educator talked about data smog using the term “carpe datum.” And finally, one more teacher posed the question, “With all this flipping, blending, and stirring, I wonder whether we are a school or the Food Network.” The Internet is replete with websites focusing on humor in education. Googling “humor in education” will open up a whole new world. And remember, stressed spelled backwards is desserts! Oprah Winfrey noted in her commencement address to the Harvard class of 2013, that “the key to life is to develop an internal, moral, emotional GPS that can tell us which way to go.” Each of us should be filled with a relentless determination to be the best we can be, and reconsidering how we do business in our schools may just be the right way to proceed. Oliver, Bruce. “All Things Reconsidered.” Just for the ASKing! August 2013. Reproduced with permission of Just ASK Publications & Professional Development (Just ASK). © 2013 Just ASK. All rights reserved. Available at www.justaskpublications.com.